The body of Inspector Ian Welch near the badly damaged Guyana Police Force patrol vehicle in which he was travelling. 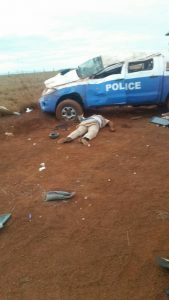 Guyana Police Force Inspector, Ian Welch was Tuesday killed and three other policemen sustained injuries when the patrol vehicle they were travelling turned over twice at Lethem, Rupununi, an official said. Welch, who was seated in the right front seat, sustained severe head injury. He was pronounced dead on arrival at the Lethem Hospital. Welch ,38, was married and hailed from Rose Hall Town ,Corentyne,Berbice. He joined the Force on May 5,1999 and he was recently recognized by that law enforcement agency after having been adjudged third place winner of its Quarterly Essay Competition. Police later said in a statement that driver of Force Vehicle PVV662 in which the Inspector met his demise,Constable Lyzandel Northe, together with Corporal Fitzgerald Adolphus, Special Constable Ryan Doris and Rural Constable Chavez Francis, sustained minor injuries. They were treated and were being kept for observation at the Lethem Regional Hospital. Police said the mishap occurred in the vicinity of Rattlesnake Hill, Lethem at about 5:15 PM. “An investigation has so far revealed that the ranks were on patrol duty when the vehicle which was proceeding along the trail ,experienced a ‘blow out ‘of its right rear wheel after which the driver reportedly lost control and the vehicle turned-turtle twice before it came to a halt,” the Guyana Police Force said in its statement.